Discover the all-new 2019 Honda Passport at your Spinelli Honda dealership in Montreal. Learn more about this brand-new model as of today! 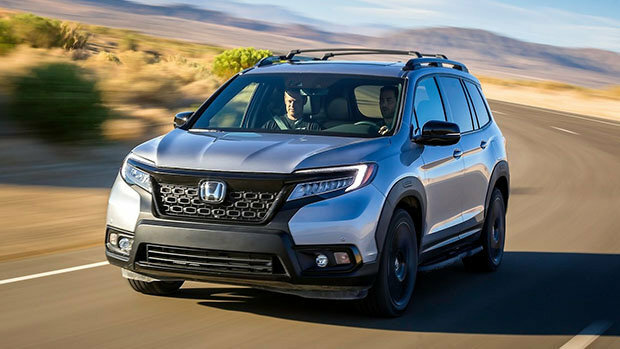 The all-new 2019 Honda Passport was unveiled as a world premiere on November 28, 2018 at the Los Angeles Auto Show, and one thing is certain: it will be a big hit as soon as it arrives at Spinelli, the Honda dealership near downtown that will offer you the widest selection of new and used Honda cars and SUVs! While waiting for the arrival of this brand-new addition to the big Honda family, come and learn about our Honda promotions as well as our hottest Honda financing options! We are located in Montreal, not far from Laval, Vaudreuil and Île Perrot. The 2019 Passport will take its place between the CR-V and the Pilot in the Honda line-up when it enters the Canadian market in early 2019. Developed exclusively by the US-based R & D team, it will meet the needs of North American buyers. Its reinforced unibody, its standard 20-inch wheels, its imposing stature and great capacities make it very attractive indeed! Under the hood, you will find a 280-horsepower 3.5-litre V6 engine, paired with a 9-speed automatic transmission. You will also enjoy a fully independent suspension, an intelligent all-wheel-drive system with complete traction control - which will allow it to offer exceptional off-road skills - as well as a more agile steering, among others. The passenger compartment of the Passport is very spacious! Indeed, with a utility volume of 3281 litres, it will offer the largest cargo volume in its class, as well as the largest cargo space under the floor in its segment, with 70 litres! Many more features will also be on the menu depending on the version chosen, such as an 8-inch touch screen with Apple CarPlay and Google Android Auto (standard), 3- zone air-conditioning, Smart Entry and Smart Start systems, the Honda Sensing suite, daytime running lights, taillights, LED lights and fog lights and much more! Do not miss the arrival of the all-new 2019 Passport and be one of the first to own one! Whether you live in Montreal, Laval, Vaudreuil or Île Perrot, visit Spinelli Honda as of today to learn more about it!